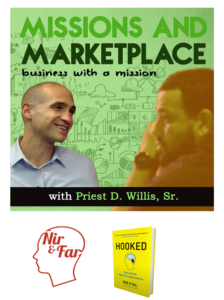 I had a fun and eye opening (or mind opening) discussion with Nir Eyal who blogged often about psychology and marketing which eventually brought him to the path of marrying the two and published a book called: Hooked – How to Build Habit-Forming Products. Hooked is a guide with a very insightful and simple thought system to building habit-forming products. If you’re a marketer, designer, entrepreneur and more, this is for you. What started his interest around the psychology around products. The ‘Habit Zone’ that’s outlined in his book and the four habits in the thought system. The key elements to consider when creating a product.